Want some further reassurance? Check out what some of our clients have to say. And, of course, you can also look at our reviews on Checkatrade. “Dr Sparky – what can I say? They’re very courteous – and courtesy goes a long way. They’re quick to act – very often the same day. They’re quick to come back, report a fault and diagnose the appropriate action. There is no fuss, they collect the keys, carry out the job and then return the keys. It really is trouble free. “Dr Sparky have a very good relationship with all our tenants and landlords. We never have any complaints – and tenants are very quick to complain about contractors! The Dr Sparky team is always available, they are very polite and conscious of cost. They do a good job, and always deliver everything we ask of them. 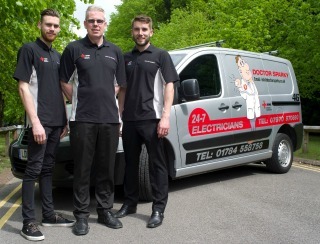 “The Dr Sparky team are great to work with. I really like knowing that they will advise if they don’t think something is a good idea, and not just go ahead – I appreciate that honesty. They are very reliable, and clearly know their stuff. They have saved us money, and given us peace of mind, knowing our health and safety commitments are being covered off. “Working with Dr Sparky certainly makes life easier for the lettings team. They free up our time because we know we can rely on them to deliver a good quality job. They respond quickly and keep us appraised of what’s happening. “We always look to appoint good reliable local contractors, and Dr Sparky certainly fit the bill. They add a layer of professionalism to our business, knowing not only are they competent, but they communicate well with everyone. They are very responsive, and deliver consistently good work. They are competitively priced too. “As the owner of a small hotel it’s really important to me that electrical work is kept up to date. Working with Dr Sparky has made my life easier and saves me time. I know I don’t need to chase them – they turn up, they do the work, they tidy up and everything is done. I think of them as good organisers, and they always turn up on time. “When our previous supplier became unavailable to continue working for us, we were worried about employing someone unknown. However Dr Sparky came to us on a recommendation and we needn’t have worried because they are completely trustworthy, reliable and efficient. Besides undertaking all the routine electrical maintenance, we have also had occasion to call them out in emergency situations and they have always responded promptly and willingly. If you would like to learn more about working with an experienced NICIEC electrician, please call 07970 970 880.